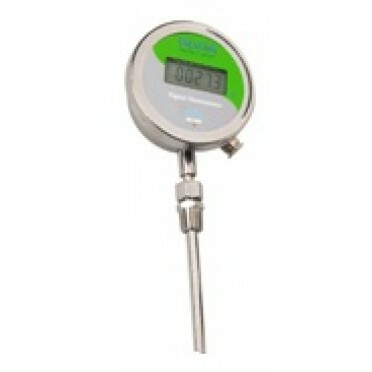 ALTOP" is first manufacturer of "DIGIDIAL" range of Digital Temperature Gauges / Digital Dial Thermometers. They are battery Operated, Accurate, Stable, Long Lasting, Low Coast, reliale and user friendly with instruments. This System Utilizes "NANOWATT" Technology and latest circuit for high grade of stability, noise immunity, repetability, and years. The resolution is 0.1oC from (-) 199.9 to (+) 199.9 and it automatically changes to 1oC above that,.12 inch log stem of 8 mm Diameter. "DIGIDIAL” can replace the conventional mercury-in-steel, vapor pressure / Bimetallic temperature gauges. These are a ideal blend the reliability and ruggedness of the conventional type Dial Thermometers and the accuracy and simplicity of Digital Temperature Indicators. The most important plus point of the “DIGIDIAL” is that they can be easily calibrated, repaired by changing the stems / capillaries / Displays units etc. unlike the conventional field system dial thermometers, which as good as “Dead” when they leak/.fail. Also available in distant type (capillary type) up to 30 Mtrs.extension length. Higher Length are also offered. Wide Temperature range -150°c to 600°c in RTD and -50°c to +1100 °c in “K” type Thermocouple. Available in 180° adjustable type in one plane. Accuracy of ± 1 % FSD ± 1 Digit over entire range. Available "DIGICON" Version with Controller working on mains power Supply.